"The hobbit : The battle of the five armies" is the third part of the movie adaptation of J.R.R Tolkien's novel "The Hobbit" (1937). Direction of the movie is done by Peter Jackson , while the screenplay by Fran Walsh, Philippa Boyens, Guillermo del Toro and Peter Jackson himself. 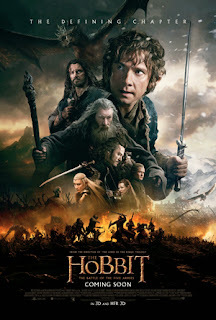 The cast includes Ian Mckellen, Martin Freeman, Richard Armitage, Evangeline Lilly, Lee Pace, Luke Evans, Benedict Cumberbatch, Ken Stott, James Nesbitt, Cate Blanchett, Ian Holm, Christopher Lee, Hugo Weaving and Orlando Bloom . The production in combinedly done by New line cinema, Metro-Goldwyn-Mayer, WingNut Films and distributed by Warner Bros. The release is expected on December 2014.